With its roots deep in Greek mythology and the first Olympics, the bay leaf is a noble herb. 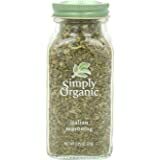 Enjoy its sweet, balsamic scent and bitter/spicy bite in gravies and grain dishes, with beans and meats, and in cooking blends like bouquet garni. The botanical name of this product is laurus nobilis l. It is qai organic and ksa (Kosher) certified. Frontier natural products co op specializes in natural and organic products. Our products are found in natural products stores and specialty shops throughout the United States and Canada. By offering easy access to high quality, competitively priced choices that are both environmentally .friendly and socially responsible, frontier seeks to lead the way in bringing nature and peace of mind to our customers. As a leading supplier of organic herbs and spices, we hold a leadership position, not only in the marketplace, but also in the effort to convert food producers to sustainable farming and production practices. 5.0 out of 5 starsBon Appetit! Bay leaves, Bay laurel, or “Laurus nobilis” are cultivated in France, Spain, Italy, Morocco, Yugoslavia, China, Israel, Turkey and Russia." The exact harvest location of our jar will not be specified, but have little worries. It is certified USDA organic and Kosher. Why is that important? Similar to non-organic food, many spices are treated with chemicals (pesticides and herbicides), contain GMOs and are irradiated. Most of us aren’t super familiar with the process of irradiation. Radiation is used to kill bacteria and other contaminants, leaving the finished product with decreased levels of vitamins and natural enzymes. Irradiation also changes the chemical composition of a spice, potentially creating toxic, carcinogenic by-products in the food. Furthermore irradation increasing our exposure to free radicals. Yikes! 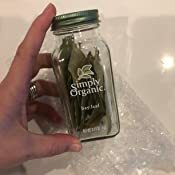 There are approximately 25 or so whole leaves in the jar. A few are broken, but that should be expected. They are potent and perfect for your stews, soups, and gravies. We are vegetarians and rely heavily on the bay leaf to add a nice bitter/sweet taste to our bean dishes. The tall glass jar (Yes, glass! It can easily be reused, repurposed, or recycled nicely.) comes with a plastic shaker cap, and a metal screw-on lid. It’s important to check the expiration date on our spices to prevent staleness or lack of potency. The bottom of Simply Organic bottles have a "best by" date to assure that you’re not getting sold old stock. Remember to store all of your spices in a cool, dark location. More flavor than the Spice Islands Bay Leaves, these are replacing. 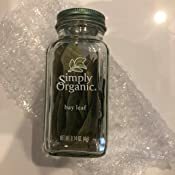 This jar contains 24 Very Large to Large fragrant bay leaves. 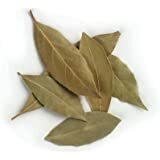 Most are over twice the size as McCormick Gourmet Collection, Turkish Bay Leaves. These leaves seem to have more of their natural oil/s retained. Left a nice flavor in the stew I just made with them. 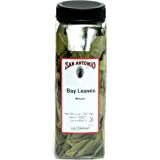 I use bay leaves in cooking a lot, mostly in soups, particularly french onion soup. These are my favorite, especially with the glass jar. 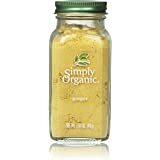 The ones in the supermarket, even in the jar, never seem as fresh as these when I order them from Amazon so I have them on a subscribe and save so I get them on a regular interval. They seem to always arrive fresh and fragrant and even when I get to the end of the jar they are still pretty good. The jars come with a freshness seal under the lid, underneath a shaker lid, which at first seemed odd, but I keep them and when I am done I make my own rub and seasoning mixtures and put them in these jars so they can be re-used. 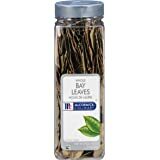 I have started cooking most of my food and was surprised to see how much bay leaf I go through. I have tried brand and store generics. 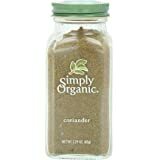 Of Walmart, Target, McCormack, and Simply Organic, I prefer Simply Organic. To me, they seem to have the freshest dried leaves. These came fresh, looked appealing and had a nice fragrance. Bottle was attractive. Good flavor, noticeable in stews, soups, stirfries. I still had a few leaves left after three months or so, and unfortunately the color and smell faded significantly. Perhaps that's to be expected. (All in all, I preferred the Turkish ones bought previously from Penzey's.) I was able to find a live bay laurel plant in the meantime, so I won't be buying more. But I'll be reusing the bottle. 5.0 out of 5 starsFresh, Potent, Great Flavor! I like this line of seasonings and spices. 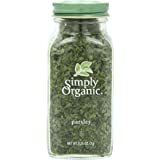 It is more expensive than other brands but I haven't been disappointed in any that I have purchased in terms of freshness, potency, flavor, etc. I got the bay leaf and it was more fresh and fragrant than other's I've purchased from local grocery stores. I would buy again, especially on sale! First of all, I like the Simply Organic spices, herbs over all others. They all seem very fresh. Have been throwing out a lot of my spices and replacing with fresh ones. When I received this, I opened it up, and smelled the Bay leaf, and it smells very fresh. Would definitely recommend this brand. Prompt delivery. 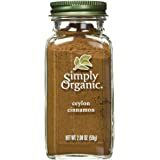 I love Spimply Organis and we buy most of our spices from them. They are organic and do not irradiate their spices. The bay leaves tasted fresh (as fresh as dried ones can be 😉) and added wonderful flair to my soups.